I didnt realize they'd be so close they are ok now but in a few weeks, it'll be bad. What do you guys think? Am I doomed? Are my plans of fresh cabbage and broccoli foiled? Can I dig up and re-plant? Broccoli can get VERY big and even more wide. Not sure on the replanting but they are pretty close. 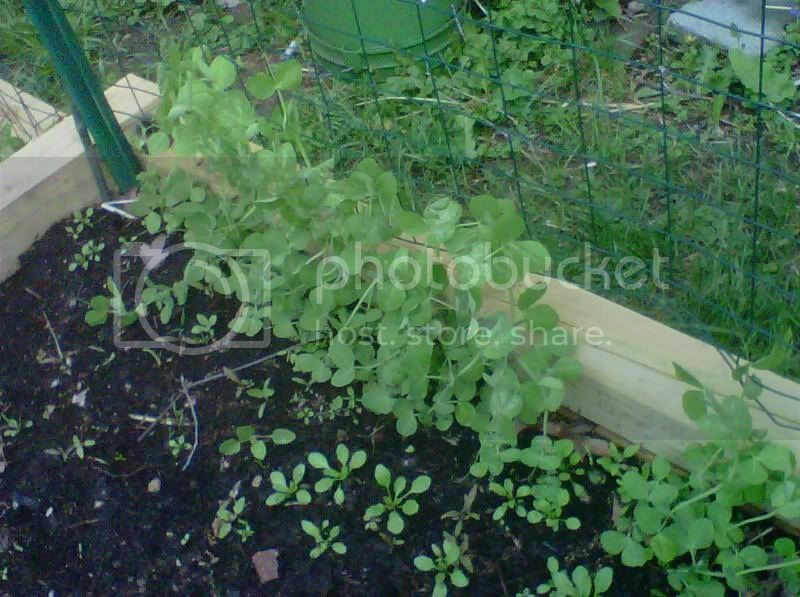 Peas are looking good they CAN be planted very close together. I planted thick and they are doing great. My neighbor suggested (who suggests everything - ugh. Whos tom plants died over the weekend from this cold spell...but I said nothing.) said I should pull out the smaller plants ...but I worked sooooooooooo hardddd for these babies. They are green and happy in the cool weather - I'd hate to thin them now seeing how I've nutured them this long. lol - omg am I pregnant or what? 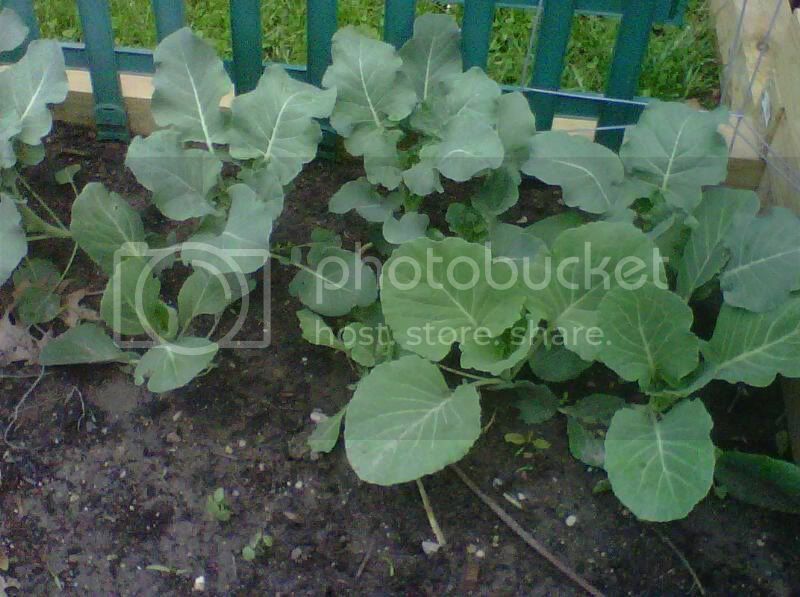 In a little while, the broccoli will start elongating and will stand taller than the cabbage. (For future ref. you can make better use of the space if you alternate cabbages with broccolis -- cauliflowers, too, I believe.) If you're OK will smaller sized heads, I think you can let them grow close. If you want a good sized head from each, just so you can say you grew them, then choose the ones you want to supersize, harvest the leaves off the closest neighbors and eat them like collards -- they're tender enough to eat in salads when small. Another way to make use of your current planting is to harvest the leaves off every other plant. Obviously, don't expect the plants with no leaves to produce heads. Both the cabbage and broccoli will transplant well when that size. Cabbage for sure needs to be spaced about 18 inches. The broccoli will stand a little more crowding. If you want the real large heads on the broccoli it is well to space it 12 inches. If you decide to move some of it, do it toward evening and water it well. If possible keep a little ball of soil on the roots when digging it. Last edited by jal_ut on Thu May 13, 2010 1:42 am, edited 1 time in total. I like to space my lettuce plants 12 inches too. That way they will make a nice large head. If you let it go so crowded, all the leaves will be wimpy. Lettuce will also transplant well when small. I hadn't thought of transplanting. I'm just recently wrapping my head around the fact that you could grow transplants in the ground in nursery beds and transplant them elsewhere in the garden. Somehow, I'm conditioned to think transplants are grown in pots. I HAVE been transplanting my self-seeded lettuce, and dug some up for my Mom's garden as well. The lettuce grows into simple leaves - it's my 2nd batch. The first one was great but the family ate it before I got a chance. Take a garden trowell and dig a hole to put the plant, then go dig it up by just inserting the trowell into the soil near the plant you want to move and simply pry it out of the ground, then with the soil that is still on the trowell and covering the roots place it in the hole you dug and push some more soil around it. Firm the ground. then water. If you can keep the soil around those roots, it will have very little transplant shock. 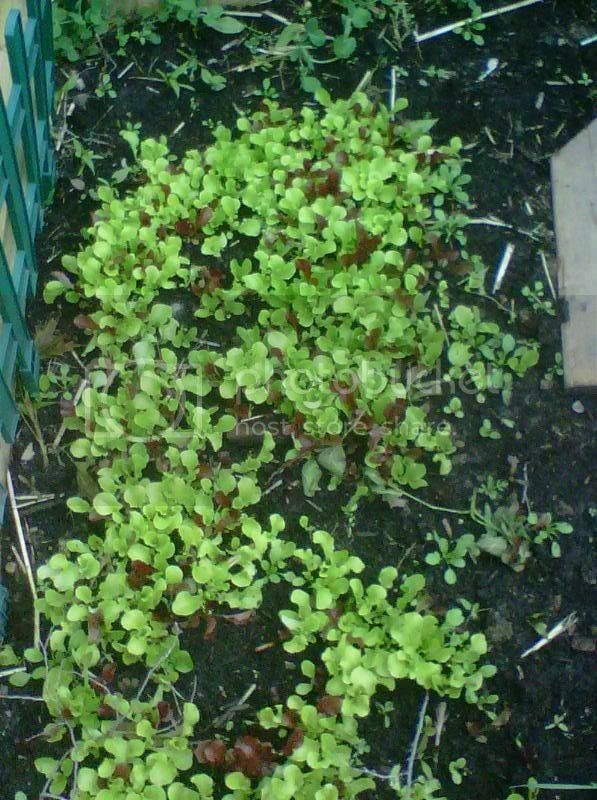 For the fun of it try giving one or two lettuce plants some room and let them grow up. You may be pleasantly surprised. The leaves get larger and have better body and flavor. 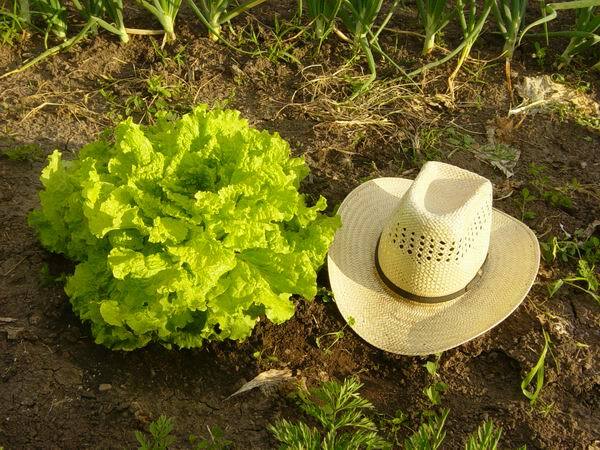 This is one plant of lettuce. You just harvest the whole plant. You can see why I said give a lettuce plant 12 inches. I agree, re the broccoli, transplant them, they are way too close together. My broccoli was close to that size when I put it out from being started indoors. It will transplant fine. The lettuce is also VERY close together. The way to deal with that is let it get just a little bit bigger and then thin by eating. In other words when you want to eat some, just pull some of the little plants out by the roots. Cut the roots off and use the rest as baby lettuce in your salads. That will make room for the rest to get bigger. Zap, go ahead and do your transplanting; the plant's will be fine. On a bit of a side-note: Jal, that lettuce looks great. Was it direct-sown or transplanted? Mine never seem to get too big, but they are direct-seeded. I direct seed my lettuce. I will put 3 or 4 seed in a bunch every foot in the row, then when it is about an inch tall thin the bunch to one plant, so I have a single plant every foot. Every year I have some that goes to seed in the garden. Next spring it comes up volunteer. I will sometimes transplant some of the volunteer plants to a row. How do you prepare that hat for cooking? Do you have a recipe? Don't thank me too much the whole planting peas very close was Jal's idea too. I also do the same lettuce technique, though I will take credit for this. I plant mine about a foot or so. I also thin them out a bit at first let them grow a bit and transplant the thinnings. Some do okay other do not but you never until you try. I very big on not wasting plants. Sometimes I have to grit my teeth and close my eyes when thinning plants I'm not transplanting. Only planting a few seeds in a given space is also way better than a furrow with a line of seeds, the line is such a waste of seed and time in thinning. Ever had EVERYTHING that you planted come up? How do you tell what you planted?